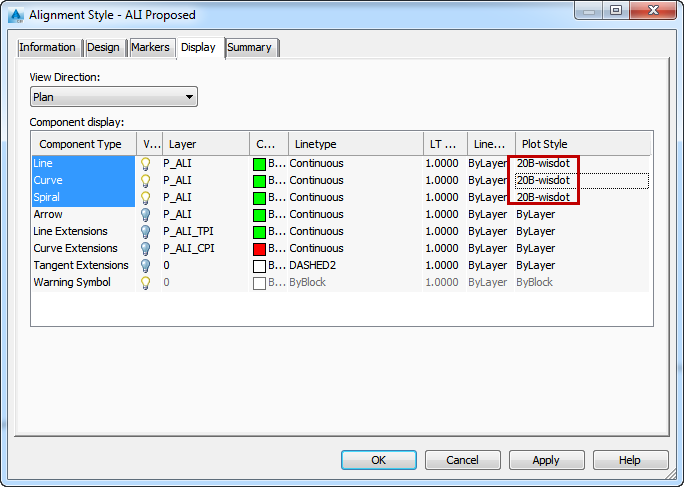 AutoCAD Civil 3D allows a drawing file to be created using color dependent plot styles or named plot styles. I created a drawing using named plot styles. 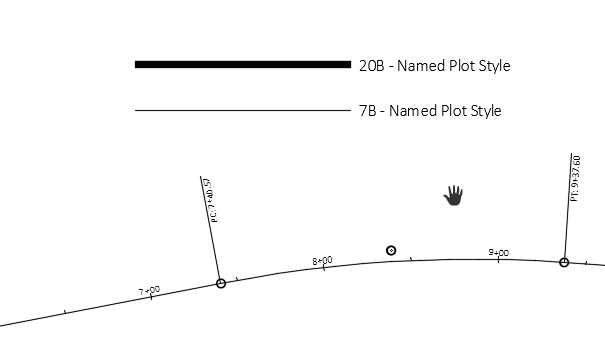 My plot styles are named 0B to 20B with 0B being the thinnest line and 20B being the thickest. I have a drawing with an alignment. The alignment style components are set to plot “By Layer”. 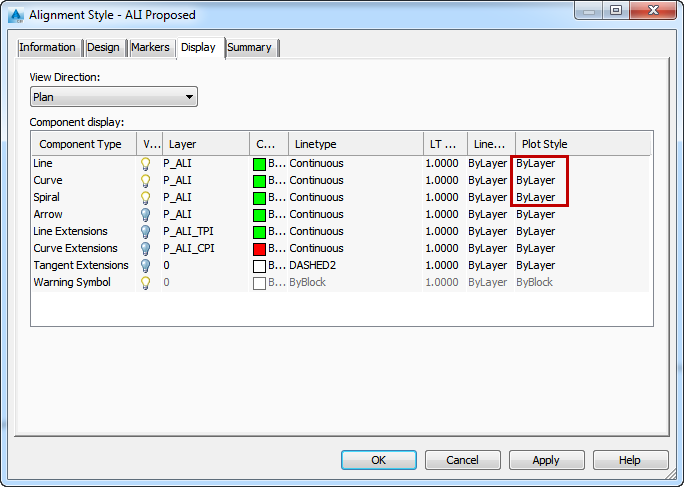 The alignment layer has a plot style setting of 7B. Let’s look at a plot preview. There are reference lines in the preview for comparison. We can see the alignment plots with a 7B plot style as expected when the Civil 3D alignment style is set to plot “By Layer”. Now let’s edit our alignment style and set the plot style from “By Layer” to something else. Some of the alignment components are now set to plot with a style of 20B (The thickest line in my plot style table). Let’s look at a plot preview now. After editing the style, we would expect the alignment will now plot with a much thicker line. As we can see, editing the plot style in our alignment style had no effect on our output. The alignment components are still plotting “By Layer” even though we assigned them a specific plot style. 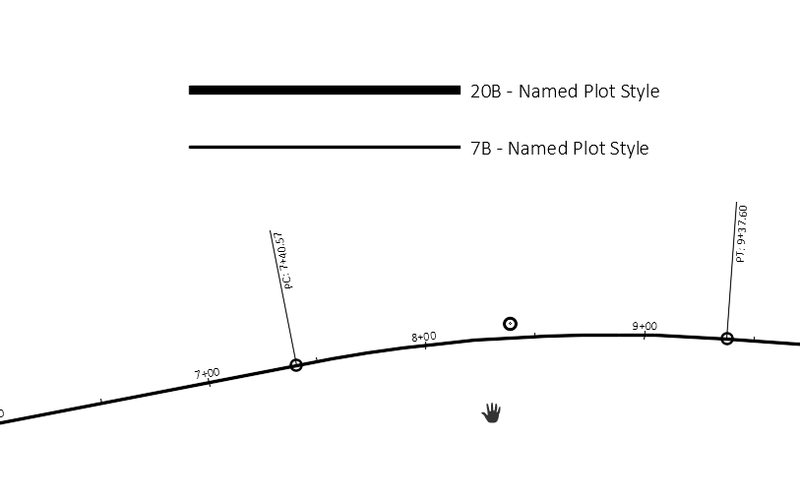 It appears named plot styles cannot be set in a Civil 3D style. Keep this behavior in mind when creating Civil 3D standards or planning a new Civil 3D project. My biggest problem with using Named Plot Styles is that label settings don’t have plotstyle as an option for all the components. It is rather irritating. Yes, I also wondered why there is no option for plot styles in labels. The fact that the plot styles don’t seem to work in other Civil 3D styles makes me think they might have left that option out on purpose.